Step 2 Rub 1 of the garlic cloves all over the inside of a large 1 1/2 quart oval casserole dish. Smear some of the olive oil all over the inside of the dish. Mince the rest of the garlic. Step 3 Heat the rest of the oil in a saucepan over medium heat. Add the garlic, onion, and pepper, season with the salt and pepper, and cook until tender, about 8 minutes. Add the vermouth and simmer to reduce by about half. Step 4 Using a mandoline or vegetable slicer, slice the potatoes about 1/8-inch thick and add them to the pan with the water, salt, pepper to taste. Bring to a boil over medium-high heat and cook, stirring, until the mixture has thickened slightly, about 2 minutes. Step 5 Stir in the basil. Step 6 Transfer the mixture to the prepared baking dish and shake the pan to distribute the potatoes evenly. Season with salt and pepper. Slice the tomatoes about a 1/4-inch thick and arrange them in a shingled pattern on top of the potatoes. Season with salt and pepper and drizzle with olive oil. Step 7 Bake, uncovered, until the potatoes are tender about 1 1/2 hours. Sprinkle the cheese over the top and bake until brown and bubbly, about 15 minutes more. 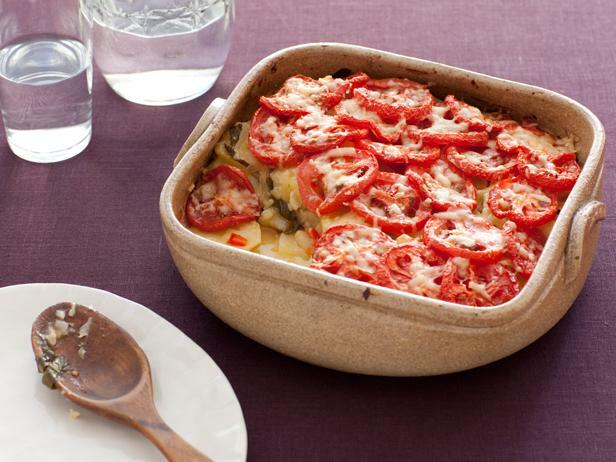 Remove from the oven and let casserole cool 10 minutes before serving. This can also be served at room temperature.